During our first meeting of 2015, President Al Churchill gave us an excellent impression of what life was like in Calais during the start and progression of the Second World War. Al provided slides of scanned images from the Calais Advertiser and other sources to illuminate how the war effort was portrayed by the media, as well as advertisements from area businesses that used the colored ration stamp system. 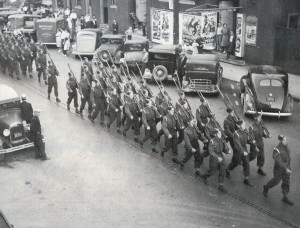 Canadian soldiers march down Water Street in St. Stephen in 1940. 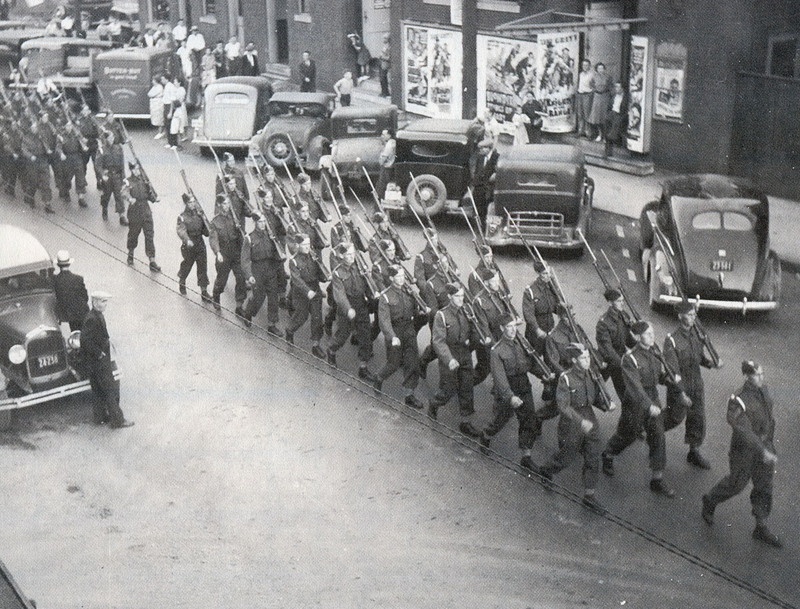 Many Calais residents enlisted when Canada entered the war. Unlike most areas of the country, Calais residents widely supported entering the war as soon as Britain became involved in it. With no real barrier perceived between the communities of Calais and St. Stephen, many townsfolk from Calais enlisted as soon as their Canadian brethren were called to arms. “The community was completely invested in the war,” Al said. “Hundreds of men and quite a few women signed up for the effort directly.” Even if one didn’t enlist and wasn’t eligible for the draft, the impact of the war became rapidly felt as the ration system was introduced. “When rations started, everyone became a part of the war effort,” former SCHS President Brand Livingstone said. Brand was a little younger in those days. “My family would talk about it around the table. Gasoline was a big problem,” he said, saying his father wasn’t able to travel between his home and his job so he had to get an apartment closer to his work. By 1943, fuel was so scarce that if a household didn’t have wood or coal heat, it would be left on its own in the cold. As the war continued, more and more amenities became limited in their availability. Goods like coffee, sugar, and cigarettes were gradually taken off the market or restricted. In Calais, some items were under ration that had no such restrictions in Canada, and despite severe penalties, smuggling became rampant. Air raids and saboteurs were regarded as a real threat during the war, and periodic air raid drills were staged. Mandatory lights out sessions were held with frequency, with flagrant violators at risk for visitation from uniformed officers. Outposts were set up in the highest places in the town (such as near Chandler and Pleasant Street) to monitor the skies for bombers 24/7. USO dances were held frequently to entertain troops and their friends and families. This shot from 1944 has Jessie Baig in the lower left. The State Theater offered residents a chance to escape the concerns of the war (along with $10 in war stamps as a door prize) with its latest Hollywood feature films. In December of 1943, the theater was playing Northern Pursuit (with Errol Flynn), Henry Aldrich Gets Glamour (with Jimmy Lydon), and Bar 20 (with Bill Boyd). 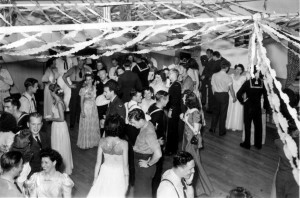 Other forms of entertainment were offered by the United Service Organization, which held dances at the VFW hall on Lowell Street (in the building that burned in the 1960’s) and at the Academy Street gym. With resources scarce and a tense mood hanging over the nation, the birth rate was low and prospects for the future seemed increasingly slim. Accordingly, F.L. Stewart Furniture Co. of Calais sold all its baby carriages at up to 40% off in January, 1944—no doubt a regrettable choice when demand skyrocketed during the postwar baby boom a few years later.